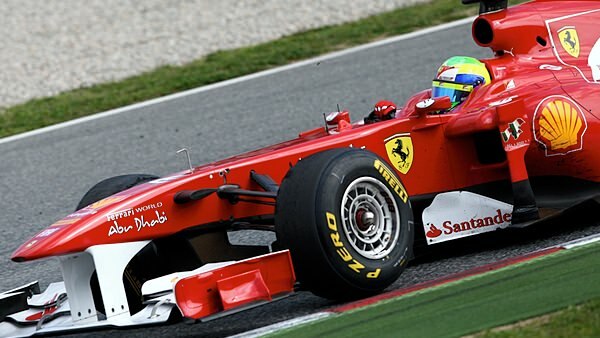 Felipe Massa topped the timesheets on the last day of Barcelona testing this week, as Ferrari found pace over Red Bull. The team were running a heavy day with Massa completing over 120 laps, and they revealed some of their intended plans via Twitter this morning. Today's programme includes tyre comparison and set-up changes. The weather is fine with clear skies. Temperatures are still a bit cold. Webber was second for Red Bull, with Sébastien Buemi third for Toro Rosso. Lotus had a terrible day, cut short by a crash out on track for Jarno Trulli. In their post-test press release, the team revealed that it was a car failure and not driver error that had caused the accident, and a lack of spare parts meant they had to curtail their programme mid-morning. Other teams having trouble included Jérôme D'Ambrosio who stopped out on track and was whisked away for a lengthy delay in the garage. Michael Schumacher and Pastor Maldonado both caused some stoppage time when their Mercedes and Williams cars stopped out on track.